I watched The Hurt Locker tonight. I don't think it's a stretch to say that this movie is my generation's Apocalypse Now. More on the entire movie later, though, I'm still a little close to it. 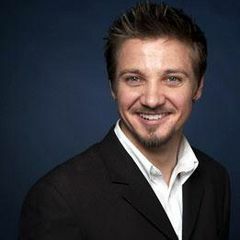 Early on Jeremy Renner (pictured) is kitted out in a bomb suit with helmet and he's striding purposefully across the sand when he reaches up and, quite matter-of-factly, flips the visor down. Having done some work on my Shakespeare before I put the DVD in I found myself for a moment wondering if he'd practiced that. Was he clumsy with the visor for a while and just wore the suit long enough that he figured it out? Maybe just being fully present in the character gave him the surety to do it? I mean, that's what actors do, really, we simply walk the walk until other people believe we are who we are. Then I had a terribly melodramatic moment when I thought, "Crap, that's how I'm living my whole freaking life." i will always put my helmet down a nanosecond after you.